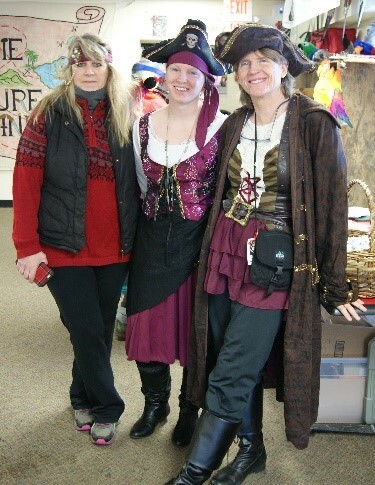 Kristie Owens, Sam Olney, and Sandy Olney enjoy a festive day at our Pirates of the High Skis!. FRANCONIA – Ahoy Mateys! Cannon Mountain will be hosting Pirates of the High Skis! on Saturday, Feb. 2 from 9 a.m. until 3 p.m. Come out and ski or ride in your finest pirate garb as you search for hidden treasure on the slopes, earning chances to win the captain’s share of our plentiful bounty of raffle and silent auction items. This family-friendly event supports Adaptive Sports Partners of the North Country (ASPNC) and the mission to enrich the quality of life for people living with disabilities through year-round sports, recreation, and wellness programs. Skiers and snowboarders of all ages and ability levels should dress as pirates and wenches and spend the day searching the slopes of Cannon Mountain to find clues, complete tasks, and collect treasure coins for additional chances to win prizes. There will be a (temporary) tattoo parlor, a Pirate’s Portrait gallery, a silent auction with valuable items, hourly prize drawings, Luck ‘O Brotherhood raffle, and other fun, festive activities. Register now at www.adaptivesportspartners.org/news-events/phs/. The earlier you register – the more chances to win you will have! An extra treasure coin is given for each day registered prior to the event. Please contact the ASPNC office for additional information. Call us today at 603-823-5232 or email info@adaptivesportspartners.org. Adaptive Sports Partners of the North Country (ASPNC) is a community-based, not-for-profit organization with a mission to enhance the quality of life for people with disabilities. ASPNC accomplishes this by providing year-round sport, recreation, and wellness programs through the Franconia area, North Country of New Hampshire, and Northeast Kingdom of Vermont. Adaptive Sports Partners of the North Country’s office is located in the Franconia Marketplace, 297 Main Street, Franconia, NH. For more information please visit www.AdaptiveSportsPartners.org or call the ASPNC office at 603-823-5232.